303 (30674) Fabric Guard, 128 Fl. 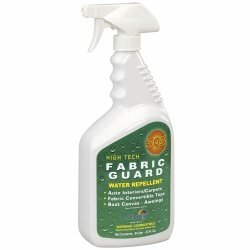 303 Products 30616 Marine & Recreation Fabric Guard Trigger Sprayer 16 oz303 Fabric Guard is the only product recommended by and for Sunbrella, as well as other fabric manufacturers to restore lost water repellency to fabrics. Resist water, even when youre on the water. 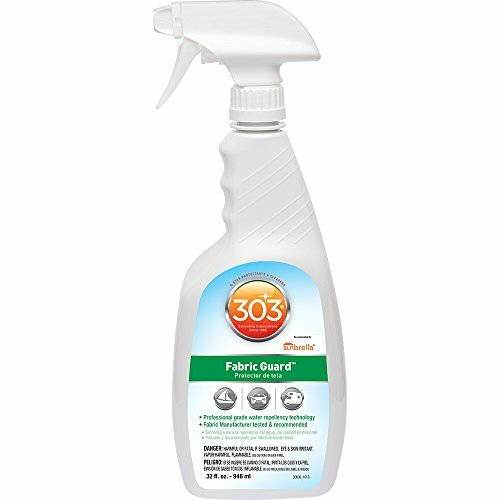 303 Fabric Guard creates a powerful shield to greatly increase repellency and protect against oil and water- based stains. Spray it on outdoor leather seats, boat covers, awnings, Dacron sails and more! When applied to clean and dry fabrics, 303 Fabric Guard restores lost water and stain repellency to straight-from-the-factory levels. Keep all your favorite fabrics crisp and clean for years to come. Restores lost water and stain repellency to factory new levels. Provides strong resistance against soiling. Protects against water-based and oil-based stains. Does not alter fabric color, feel, flammability or breathability. Safe for the synthetic or natural fibers. 16 ozUses: Bimini Tops Sailcloth Boat Covers Fabric Awnings Jet ski covers Rain Gear Sports Apparel & GearTHANKS FOR LOOKING! Features and Benefits: Commercial grade. Creates and maintains water repellent. On outdoor fabrics the best choice to stop leaks. Protects textiles against soiling, water-based and oil-based stains. For all indoor and outdoor fabrics, carpet and upholstery. 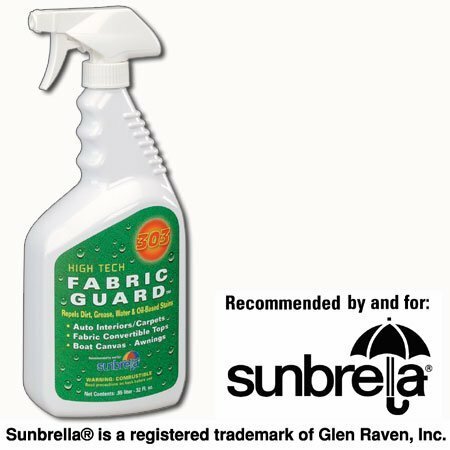 The 303 Hi Tech Fabric Guard™ is recommended by Sunbrella®. For all indoor and outdoor fabrics:carpeting, upholstery, marine canvas, fabric convertible tops, tents, breathable rainware, hiking boots, fine garments including wool, silk and suede. 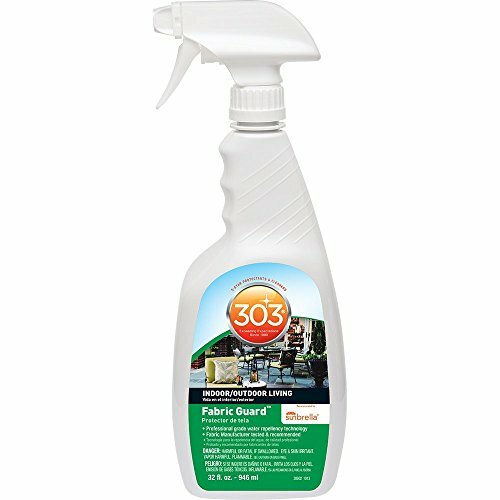 303 (30602) Fabric Guard, Upholstery Protector, Water and Stain Repellent, 32 fl. oz. 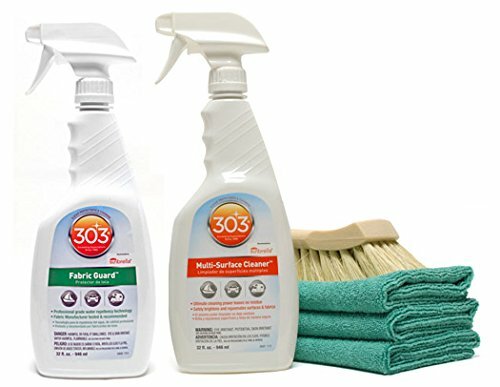 303 High Tech Fabric Guard & Cleaner Combo is a carefully thought out 303 kit that provides powerful cleaning and protection for outdoor fabrics and cloth convertible tops! The 303 High Tech Fabric Guard & Cleaner Combo provides technologically advanced care to all fabrics, including fabrics exposed to the elements. 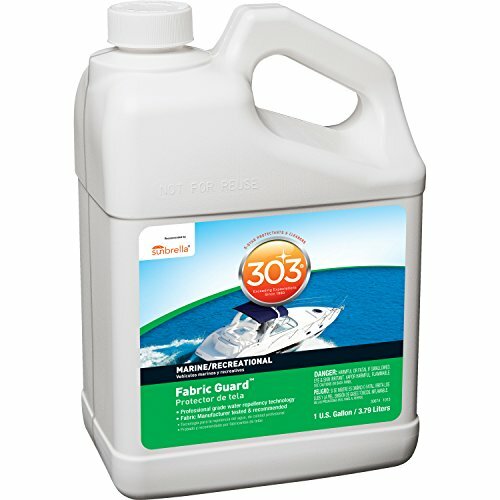 Use 303 Fabric/Vinyl Cleaner and 303 High Tech Fabric Guard on fabric convertible tops, carpet, upholstery, fabric bimini tops, awnings, even leather and silk! 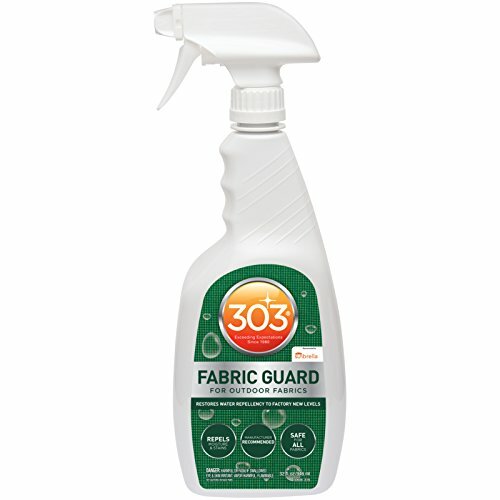 The 303 High Tech Fabric Guard & Cleaner Combo is safe on all fabrics. The 303 High Tech Fabric Guard & Cleaner Combo is ideal for anyone with a car, boat, or RV, and it delivers fantastic results around the house. Use these products on patio cushions and furniture, car seats and carpets, convertible tops and jackets. The options are endless! Copyright © Wholesalion.com 2019 - The Best Prices On High Tech Fabric Guard Online.